The main difference between egg freezing and embryo freezing is that the eggs are frozen before fertilization in egg freezing method whereas eggs are frozen after fertilization in embryo freezing method. 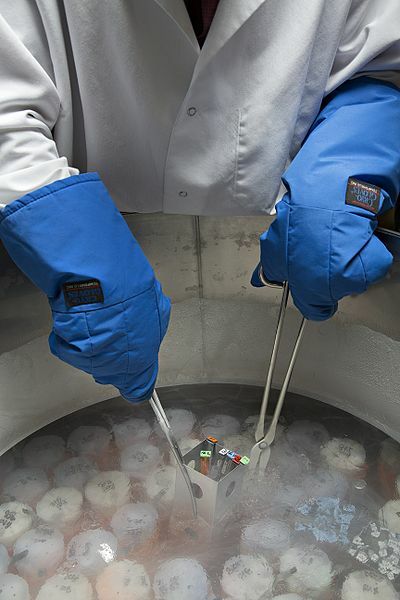 Furthermore, frozen eggs have a less potential to survive while embryos have higher survival rates during freezing and the following thawing process. Egg freezing and embryo freezing are two methods used in fertility preservation. Both frozen eggs and embryos can be flash frozen and thawed later when needed. Egg freezing is a method used in the fertility preserving in women. The main significant feature of this method of fertility preservation is that it uses unfertilized eggs. The first step is the hormone medication, which induces the production of multiple eggs. Here, multiple eggs increase the potential of fertilization. Mature eggs can be collected from ovaries and frozen by flash freezing with liquid nitrogen. After thawing, these eggs can undergo fertilization in vitro. Importantly, multiple eggs increase the chance of finding a healthy egg later. Embryo freezing is the fertility preservation method which involves fertilized eggs. It means that the eggs obtained through hormonal induction undergo in vitro fertilization. Here, eggs are incubated with sperms for several days, allowing them to develop into embryos. Then, these embryos can be flash frozen. More importantly, the survival rates of frozen embryos are somewhat high in comparison to frozen eggs. It is due to the less delicacy of embryos in comparison to eggs. Egg freezing and embryo freezing are two methods used in fertility preservation. Another name for both methods is cryopreservation. Here, the method used in the freezing is flash freezing or vitrification. Both eggs and embryos are large cells, which contains a higher content of water. During freezing, this water content is taken out from the cells. Then, the cells are placed on liquid nitrogen for quick cooling to -196ºC. The low temperatures involved in the freezing pauses cell activity as well as ageing. Hormone medication is the first step in which hormones are injected for 8-12 days in order to induce the production of multiple eggs. Here, multiple eggs increase the fertilization potential. After thawing, the eggs and embryos are healthy as they were at the time they were frozen. 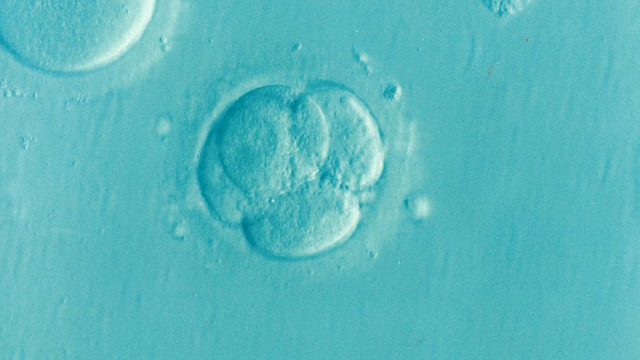 Also, in vitro fertilization is the method used to fertilize eggs in both methods. Egg freezing refers to a process in which a woman’s eggs (oocytes) are extracted, frozen and stored as a method to preserve reproductive potential in women of reproductive age while embryo freezing refers to a procedure in which eggs are removed from a woman’s ovary and combined with sperm in the laboratory to form embryos. 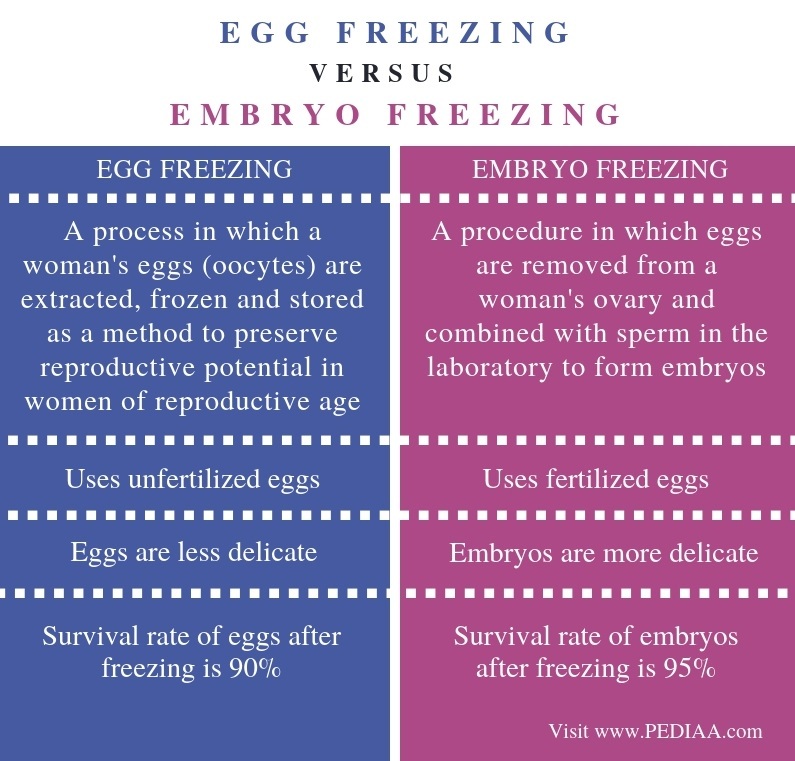 Thus, this is the main difference between egg freezing and embryo freezing. Moreover, egg freezing uses unfertilized eggs while embryo freezing uses fertilized eggs. Another difference between egg freezing and embryo freezing is the delicacy of eggs and embryos. Eggs are less delicate than embryos. The survival rate of eggs after freezing is 90% while the survival rate of embryos after freezing is 95%. Hence, this is another important difference between egg freezing and embryo freezing. Egg freezing is a method of fertility-preserving in women. It freezes multiple eggs and thawe them later when needed. Here, the eggs are unfertilized. But, embryo freezing uses fertilized eggs during the method. Generally, eggs are delicate and have low survival rates than embryos. The main difference between egg freezing and embryo freezing is the type of eggs used and their delicacy.